I've always wondered what to do when I ran across some blasting caps. Today I took Dad out to a late Father's Day lunch at Bangkok Thyme. I ran across Coco with one of the Refuel oil collection trucks between there and Food 101. Here he is talking to Zach outside The New York Butcher Shoppe. 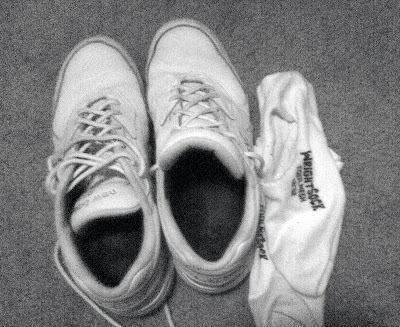 My WrightSocks have not failed me and I highly recommend them. They have a nice little exhibit showing the process too. I've been reading a lot about the sazerac cocktail lately so today I decided I'd make one. I didn't add a drop of Angostura bitters... perhaps I'll try that next time. The taste of the Absente is very subtle as there's only enough to coat the glass, but you can still tell it's there from the faint hints of anise. 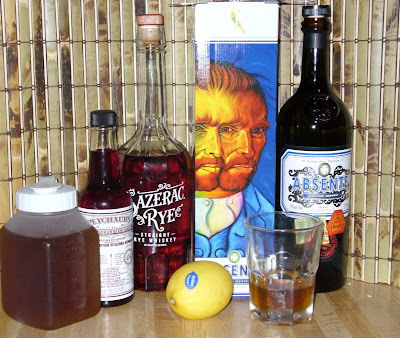 The Peychaud's adds all sorts of other flavors to the rye but it's balanced out by the sweetness of the simple syrup. The lemon peel twisted above the drink and rubbed on the rim of the glass seems to add a lot more in the olfactory sense than it does to the taste buds. Overall it's a nice sippin' drink. I'll have to try a sazerac in New Orleans some time and see if I did it right.